Las Vegas should put an end to the NRA “good guy with a gun” line. The Las Vegas shooting demolishes the NRA’s “good guy with a gun” argument. People stand behind police barrier tape outside the Mandalay Bay Resort and Casino on Monday following a mass shooting in Las Vegas on Sunday night. On Sunday night on the Las Vegas Strip, a gunman rained bullets on a crowd enjoying a country music concert from his hotel room hundreds of feet above. At least 58 people were killed in the barrage, and an estimated 515 other victims were rushed to local hospitals for treatment, making it the worst mass shooting in American history. If the carnage in Las Vegas ultimately alters the gun debate, it won’t be just because of the casualty count, staggering though it is. It will be because the circumstances of the shooting nullify the central animating argument that the National Rifle Association has deployed throughout the numbing succession of public mass shootings—there have been 28 of them, by one count, since the massacre at Sandy Hook Elementary School in 2012. Per the NRA, the sole prescription for securing our country against mass shooters, terrorists, and evildoers is for Americans to arm up. “The only thing that stops a bad guy with a gun,” goes NRA leader Wayne LaPierre’s confident formula, “is a good guy with a gun.” The group has cited one form or another of this dictum as it has fought to ensure that federal and state laws present the lowest possible hurdles to civilian gun possession, while facilitating the carrying of guns in as many public place as possible. The NRA’s argument was always belied by law enforcement records on active shooter scenarios. But Las Vegas exposed its complete illogic. The Clark County Sheriff’s Department said that the suspected gunman, Stephen Paddock, 64, carried out his attack from the 32nd floor of the Mandalay Bay Resort and Casino, which sits across the street from where the final acts of the 91 Harvest Festival were playing Sunday night. The entrance to the concert grounds are approximately 200 feet away from the Mandalay building. The 43-story hotel is 480 feet tall, according to the Council on Tall Buildings and Urban Habitat. Rough math indicates that the shooter was about a football field’s length away from his victims when he opened fire. The concert venue prohibited attendees from bringing weapons. But even had revelers been allowed to bring their guns, they would have been useless to slow the rounds spraying the audience from above. 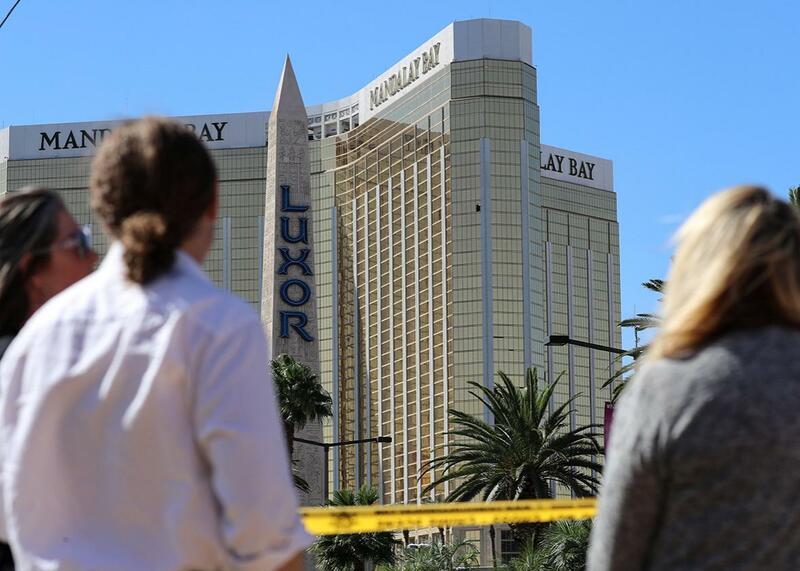 The Las Vegas mass shooting is not the first time a perpetrator has combined a high-powered gun and capacious ammunition magazines to kill and injure victims from vantage points that constrained the options of first responders. In such cases, law enforcement officers have had to resort to extreme tactics to bring the rampages to an end. In 2015, a man named Robert Louis Dear opened fire outside a Planned Parenthood in Colorado Springs, Colorado, with an AK-style rifle, then forced his way into the clinic. Holed up there, he held off police, including SWAT teams, for hours before officers used a BearCat armored vehicle to approach the building, crash through a wall, and free the hostages. The former soldier who ambushed police officers during a July 2016 rally in Dallas managed to hide out in a parking garage before police used a robot equipped with a bomb to kill him. Omar Mateen, the man responsible for last June’s mass shooting at a nightclub in Orlando, Florida—until last weekend the worst in American history—was also able to keep police at bay with his Sig Sauer semiautomatic rifle and Glock pistol. He wasn’t stopped until he tried to escape through a hole that police had used a BearCat to smash in one of the Pulse nightclub’s walls. Mass shootings often precipitate calls to ban assault-style weapons, a category of guns designed for military purposes and popular with the gun-buying public. But such laws are politically challenging outside of the bluest states and hard for police to enforce. Some experts have suggested that placing limits on how many rounds a gun ammunition magazine can store could more directly and effectively reduce bloodshed by reducing the number of rounds an assailant could fire before pausing to reload. For his 2014 study, Blair examined 160 mass-casualty shootings between 2000 and 2013. He found that most incidents “ended on the shooter’s initiative,” meaning that the gunman either committed suicide, fled, or surrendered. On-duty police intervened and ended 45 of the attacks. Armed civilians or off-duty cops who shot at shooters only ended seven of the 160 incidents Blair examined. By that narrower criteria, the Las Vegas shooting ended typically: The Metropolitan Police Department said in a press release that by the time officers located his room by its fire alarm, set off by the clouds of gun smoke, and breached the door, the suspect was already dead.